Mad Hatter's Pantry: Iron Cupcake - The VEGAN Edition! As you may have already seen (from my many status updates! ), this month's Iron Cupcake: Leeds theme was "vegan". I was equally excited and scared by this theme! Excited because it finally gave me a chance to buy a "Baker's Panel" ticket and taste other people's cupcakes; scared because I didn't want my baking to be shown up by non-vegans trying their hand at it! 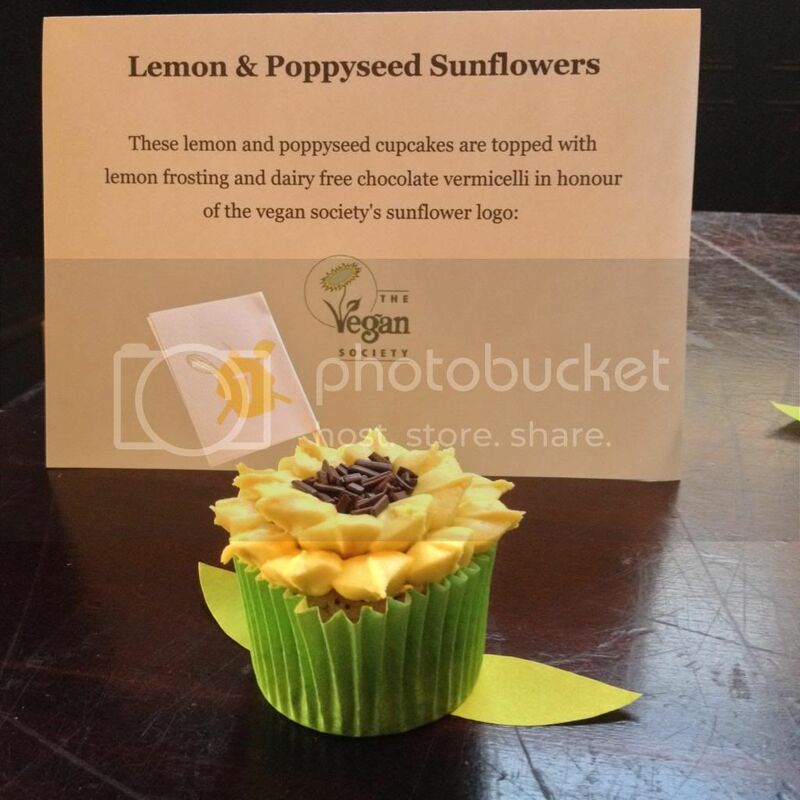 To fit in with the vegan theme, I opted to make some sunflower cupcakes, as the Vegan Society have a sunflower as their logo. 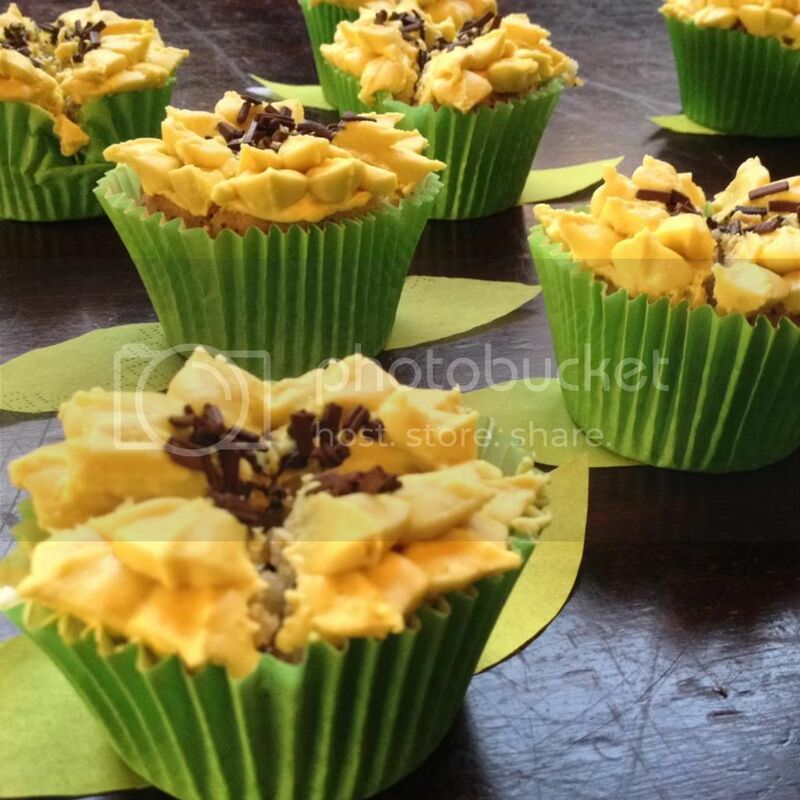 And being yellow, I thought the best flavour to do was lemon - so I ended up baking some "Lemon & Poppyseed Sunflowers". The sunny day made taking these photos so easy! The competition started and the four of us who had chosen to be on the Baker's Panel were gathered together. The idea of the Baker's Panel is that you bring an entry and also get to judge, for only an extra £3. So we all got to try ALL the entries and then we reconvened to discuss who we wanted to choose for the Baker's Panel prize. Being bakers, the judges on the baker's panel are looking at technical skills and judging what the bakers did well, using our baking knowledge as a basis for judging. We all chose the same two cupcakes as our top two and then narrowed it down to a yummy peanut buttery cupcake with home-made "Reese's Pieces" on top. Yum yum! It was so nice being able to try other people's cakes! Then it was time for the results to be announced. The prizes for taste, decoration and theme went to some very deserving entries! 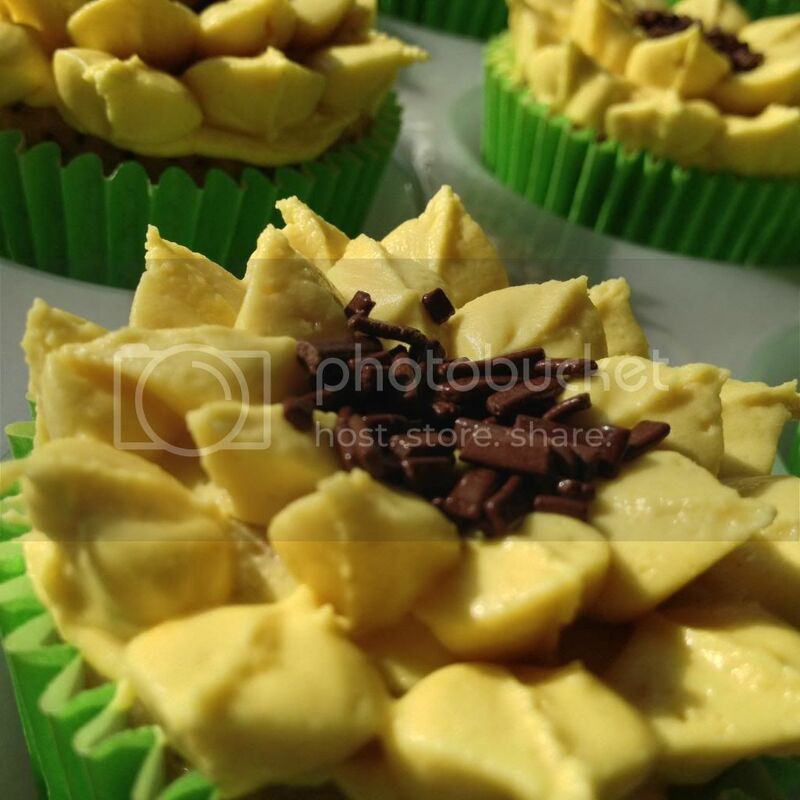 (You can see photos on the Iron Cupcake website when it's updated - go take a look!) Taste went to the same baker we had picked for the Baker's Panel prize, and decoration went to an entry called "Potty about Vegans" which had been presented in a plant pot and decorated with a flower! Unfortunately, I lost out on theme to the Raspberry and White Chocolate cupcakes (they were spectacular though!). I did win the Best in Show prize! Woohoo! To win best in show, you have to have been nominated at least once in each category and have received the most nominations overall. So all my worry was for nothing - I am very happy with the result! I won £20 to spend at the wonderful Global Tribe Cafe and I am very much looking forward to spending them! A couple of people asked for my recipe, so here it is... It does make A LOT of batter though - I managed to make 12 large cupcakes and an 8 inch single layer cake out of it, so you may want to scale the recipe down a little. This would also work well as a loaf cake if you used the entire recipe. 3. Sift in the dry ingredients (except the poppy seeds - just tip these in) and stir in with a wooden spoon until combined and no large lumps remain but do not overmix. The batter will be very thick. 5. Bake for around 20 minutes, depending on your oven - I would check them at 18 minutes as they can brown quite quickly. They are done once a skewer or cocktail stick inserted into the centre comes out clean. Once cooked, remove from the oven and allow to cool in the tray for 10 minutes before transferring to a wire rack to cool completely.